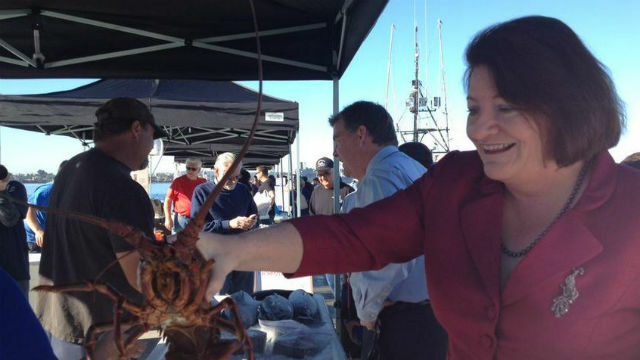 She said her “Pacific to Plate” legislation would clarify and streamline state laws that currently treat fish markets differently from other food facilities. Atkins was joined by San Diego County Supervisor Greg Cox, Port of San Diego Board Chairman Dan Malcolm and local fisherman Peter Halmay. The bill has attracted bipartisan support from San Diego’s state legislative delegation. Assemblymembers Rocky Chavez, Brian Jones, Brian Maienschein, Marie Waldron and Shirley Weber are co-sponsoring the bill, along with state Senators Joel Anderson, Patricia Bates, Marty Block and Ben Hueso. San Diego’s Tuna Harbor market has been a success since its Aug. 2 opening, drawing 350 visitors a week who spend about $15,000 weekly on fresh seafood brought directly to the pier by local fishermen.